Darcy chose not to use the flat black paint around the taillight panel. This month's feature GTX is one of 350 1970 GTXs ordered with the optional 440-6bbl 390horsepower engine with the heavy duty 18 spline manual 4 speed transmission. The current owner is Darcy Regala of Pennsylvania, owning it since 1977. 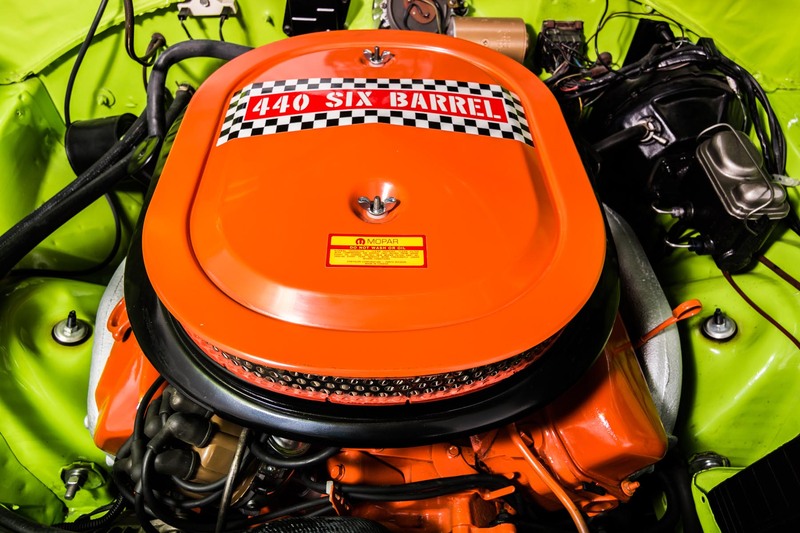 This GTX was originally ordered by a young man who it is assumed planned to race this car since it was ordered with the 440 hp engine and three 2 barrel carb setup with 4.10 gears in a Dana 60 rearend. The super track pac also came with front power disc brakes standard. Unfortunately, the original owner was killed in action in Vietnam so a few years later his father sold the car to a friend of Darcy's. About a year later the friend called Darcy up and sold the GTX to Darcy for $1700. The GTX soon got the nickname "the jet". The original owner ordered this rare GTX in the extra cost high impact limelight paint, top and bottom combining it with white bucket seat interior and white reflective side stripe. 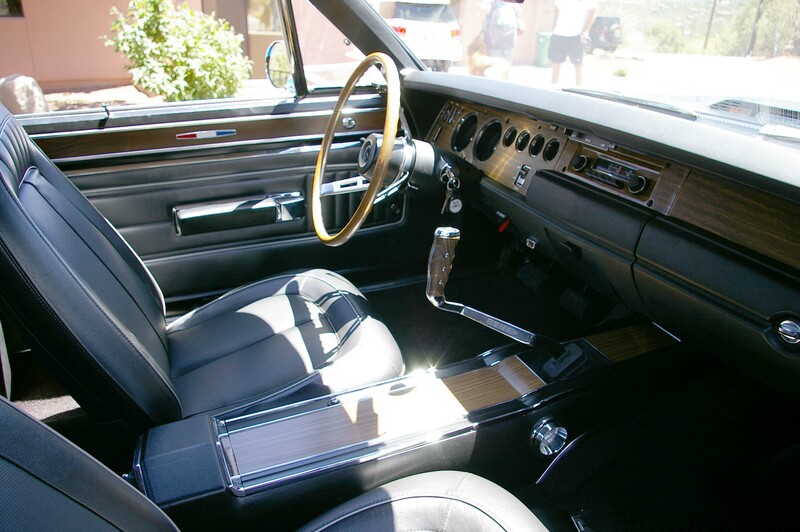 He also included the center floor console for the long handle pistol grip and 18 spline "hemi" 4 speed transmission backed by 4.10 gears in a Dana 60 rearend. The light package with hood mounted turnsignals, flat black hood performance paint were ordered on the optional airgrabber hood. According to the buildsheet the GTX had 15” ralleye rims from the factory but now has the optional Road or Magnum 500 rims. 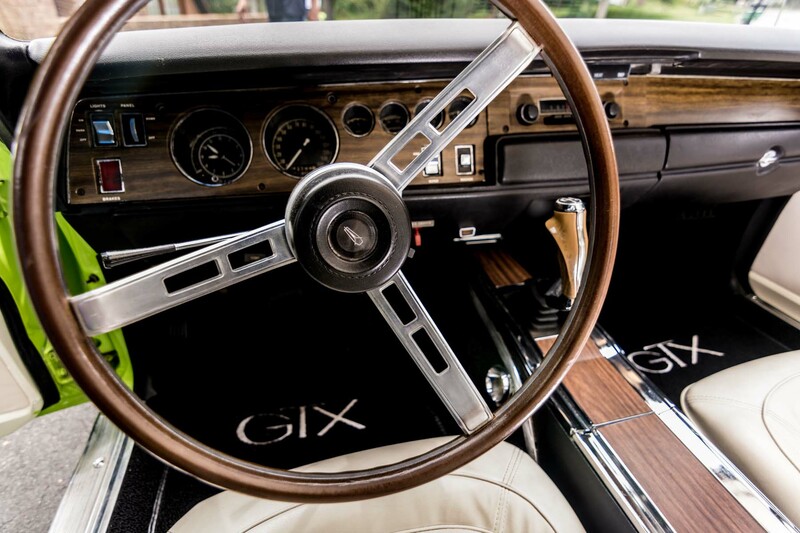 Also some time the standard black steering wheel was replaced with the very desirable optional wood grain wheel. Darcy brought the GTX out of 30 years of hibernation in March 2007 and by March 2009, a relative of Darcy's wife, Jeff Smith had the GTX looking like it came new out of the factory. Darcy's GTX is the 1243rd documented in the 1970 GTX registry. It is one of 85 in the registry that was painted FJ5. Of those 85, only 17 had the 440-6bbl engine and of those 14 were factory 4 speeds. Of the 14 440-6bbl 4 speeds only 3 were painted FJ5 top and bottom, had the light package, AM radio, white bucket seat interior, white reflective side stripes and floor console. Darcy's GTX is the only GTX of the 3 ordered with 4.10 gears as the other two had 3.54 gears. Darcy's and one of the 3.54 geared GTXs had power front disc brakes. This is one rare 1970 GTX since at this time it is the only one known to exist with the options ordered on it. Note: Darcy sold this GTX this summer at Barrett Jackson in Connecticut to help fill his kid's college education fund.